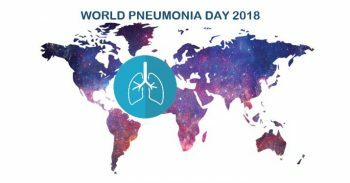 Today is the World Pneumonia Day! It occurs each year on November 12th and is organized by the World Health Organization to raise awareness on this public health concern. Pneumonia is a respiratory infection caused by microorganisms: bacteria , viruses or fungi which cause infection and inflammation of the lungs. This disease causes nowadays 16% of deaths in children under 5 years worldwide, accounting for 920,000 children deaths in 2015, and led to more than 1 million hospitalizations in adults in the US, of which 20% died. The population at risk include people over the age of 65, people who are immunosuppressed, people who already have lung diseases and children. In prevention for children, the WHO recommends vaccines (Hib, pneumococcus, measles, whooping cough), a good diet and breastfeeding for the first 6 months. Large campaigns of immunization, early diagnosis and adequate treatments (mainly antibiotics, and in a lesser extent anti-viral) are important to manage the disease.